An old legend says that sirens lived in a cave of the southern coast of the Sorrentine Peninsula, a place of pristine beauty located in front of the Faraglioni of Capri: the Bay of Ieranto. This place (a natural protected area) is the pleasant and lonely Bay of Ieranto, whose name etymologically just seems to come from the Greek “Ieros”, or sacred. The bay of Ieranto shows traces of civilization dating from the late Paleolithic, about 13,000 years ago. More recently, early in X century, it became a mining village for the extraction of lime. In 1986 the area, which is part of the municipality of Massa Lubrense, was donated to the FAI (Fondo Ambiente Italiano) and covers 49 hectares… five miles of coastline! 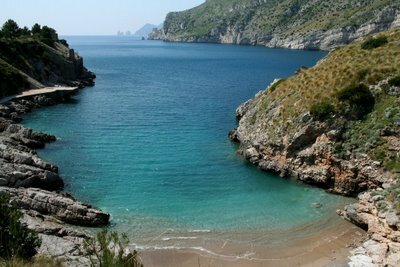 You can admire Punta Campanella (which separates the Gulf of Naples and Salerno) , the Amalfi coast, Li Galli island and Capri.